So, this is the year you finally cut loose your ‘85 Toyota’s powerful cab from its worthless, rusty frame and weld up an adventure-hungry ‘Truggy’ like your neighbor raced through Utah last summer. Or, at least, finally attach a handrail to the porch before you get too old. Either way, if you want to get welding and don’t know where to begin, your trusty local Sidney Lee Welding Supply store can provide you with the info and welding supplies you need to begin your hobbyist welding project today. We recommend you start by looking into our inventory of flux-cored arc welders like those manufactured by Miller welders. These are available for your perusal in any of our showrooms in the Atlanta, GA area, whether you are nearer to Douglasville, Hampton, Conyers, or Macon, Georgia. 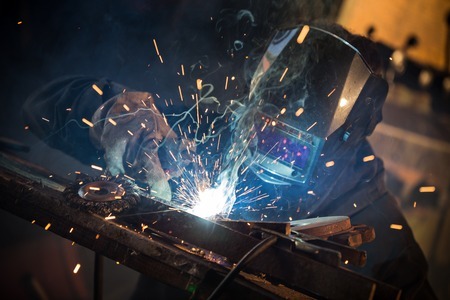 Flux-cored welders are advantageous for beginners due to the fact that they don’t require operating a tank of gas while you are busy figuring out how to weld the workpiece just right. The flux in flux-cored refers to the kind of wire fed through the welder which burns up in the process. This consumable element, one of the welding supplies necessary to operate an electric welder, protects the metal you are welding from going through a reaction that degrades its quality. If you are training to become a construction welder, this is likely the machine to get you on your way to professional welding ability. Most arc welding machines from Miller welders will double as MIG welders for when you are ready to tackle the thicker pieces of steel that await your expert hands, eventually. If you prefer to work on precision pieces with higher level of control over your weld bead, consider investing in a TIG machine. Tungsten arc welding really shines when you are looking to weld thinner pieces of metal such as aluminum or copper alloy. Depending on the metal’s thickness and type, this could be the kind of welding equipment that is best for the kinds of projects you are interested in exploring. Again, if you have questions about which welding supplies are right for you, please don’t hesitate to ask one of our dedicated staffers at Sidney Lee Welding Supply Co in the Atlanta area.